What's brown and sounds like a bell? Oddly enough, the answer to this question--dung!--is also an answer to this question: What secret ingredient did security forces in Davos, Switzerland have at their disposal to use against anti-globalization protesters? According to Business Week, Swiss security forces spiked their water cannons with liquefied cow manure. "Asked about it," Business Week reported. "one heavily armed policewoman in Davos smiled brightly and remarked: 'At least it's organic' "
To protect local street merchants from corrupt police officers and other officials bent on extorting money from them, Bangkok Gov. Samak Sundaravej called up some reinforcements from the dark side, invoking a deadly curse against the bad guys in blue. "May city police officers extorting money from street vendors, as well as those involved in racketeering to serve these corrupt officials, perish from the earth and meet their downfall." he declared in a written statement quoted by Thailand's Nation newspaper. "May their lives be forever ruined and never to flourish." The governor has vowed to have the curse posted in every district police office, the paper reports. Samek resorted to the curse only after his attempts to fight corruption in more, well, normal ways were unsuccessful, complaining, as the Nation put it, "that city police seemed to believe his order banning them from taking 'tea money' from street vendors was something of a joke." To paraphrase Al Capone: You get further with a gun and a kind word than you can with just a gun. That was apparently the logic behind the recent sentence meted out to a man who had robbed a Scottish bakery armed with a gun, albeit a toy one. The judge, one Lord Reed, apparently felt that since the gun was fake the punishment should be as well. Instead of putting the criminal behind bars, he sentenced him to community service--and told him to send the victims a nice note. "You would do well to make some significant gesture of apology to the ladies affected," Lord Reed announced at the High Court in Edinburgh. "Deliver to each of them a large bunch of flowers with a letter of apology." The shop assistants are having none of it. "I had a gun pointed at me," one told London's Daily Mirror. "At the time, I had no idea it was a toy. I would have thought he should have been jailed. He can stuff the flowers." rainbow. The sight, alas, was novel enough to startle some local drivers. 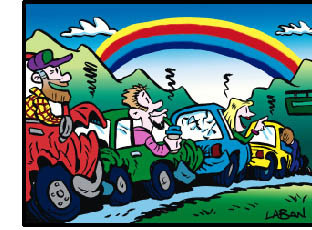 Before it was all over, the rainbow had caused a 12-car pileup on a local highway. "Our reports are that ... people were kind of looking at the rainbow, very distracted," a Washington State Patrol spokeswoman told Reuters. "Between the wet street and the inattention, we believe that's what began this whole thing. We're very fortunate not to have any fatalities."